Exit the “Rochester Expressway”—Interstate 490—at Goodman Street. Travel south on Goodman Street, toward Highland Hospital. 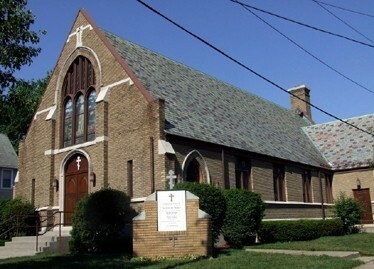 The church is on the right side of Goodman Street, three blocks from Interstate 490, at the corner of Benton Street. Parking is limited in the church lot, but street parking is available surrounding the church. Please enter the church through the main (front) entrance. The church hall and restrooms are located downstairs. For more detailed directions, visit our parish website at www.stjohnsroch.org or call 585-442-6860 and leave a voice-message with return phone number. All services are conducted in the English language. 5:00 PM Vespers followed by individual Confessions. 9:45 AM Hours; 10:00 AM Divine Liturgy followed by fellowship and religious education. General Confession is held on the first Saturday of the month after Vespers. For a complete list of upcoming services, please visit the Events page on the parish website. Parishioners represent a wide diversity of backgrounds—“cradle-born” Orthodox, converts from a multitude of religious traditions, and those seeking Christ and His Church. Many faithful have been added to the Body of Christ through the faithful witness of St. John’s parish, and for this great blessing and joy we offer thanks to God. At St. John’s, we celebrate the uniquely precious gift that each woman, man, and child is within our family of faith. We strive to be a community of love: for God and for one another. By the grace of God, we work to faithfully be “the Church” in the midst of our unworthiness. We know that we are sinners. We know, also, that our parish is the haven of those who repent and the salvation of those who contritely seek God’s forgiveness. God has been merciful, gracious and good to us—for in this holy house, we have seen the True Light! In this holy house, the fullness of the Orthodox Faith is opened to us. We hope and pray that the Holy Spirit will lead others into the fullness of Christ and His Holy Church through an encounter with Orthodoxy at Saint John’s parish. We welcome all—Orthodox Christians and seekers—to journey with us. If you live in the Rochester area or plan a visit to upstate New York, please join us for worship!